I just saw details of this new stuffed/plush toy bear that contains medical sensors, which seems absolutely wonderful as an idea. The idea is that instead of having to persuade a child patient to put up with various medical devices and sensors (like thermometers or heart rate sensors), the child just hugs a small toy bear, which contains the sensors. The data is sent wirelessly to a computer device that the doctor can then view. It’s a brilliant idea and I would think that anything that makes the time children spend in hospitals a little easier is a good thing. I’m really happy to say that SQLEditor 2.5 [60MB zip] has just been released. This has some interesting new features that have been in development for some time. Native database drivers have been something I’ve been hoping to support for ages, while process separation should improve stability and performance. SQLEditor 2.5 now includes native database support bundled with the app. Native drivers are bundled for SQLite (using standard sqlite), MySQL/Drizzle (using the Drizzle driver library) and Postgres (using Postgres client libraries). The native drivers don’t use Java at all, which gives a marginal performance improvement. Although if you’re using SQLEditor in standard, graphical mode you probably won’t notice. Native driver support means that SQLEditor should now be zero configuration for many users. Just install the app and start using it. This should be a big win, as opposed to finding, downloading and installing the JDBC drivers. It also gives a predictable and standard configuration to test, which should reduce bugs. 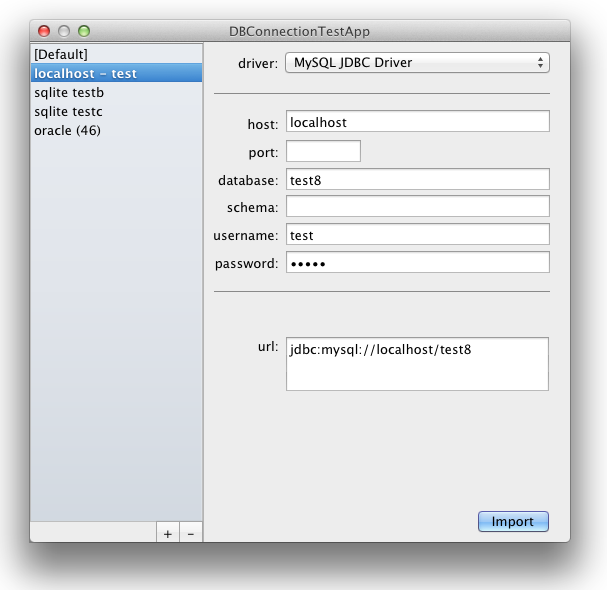 SQLEditor still supports JDBC drivers as before, but if you definitely don’t require them, the JDBC driver loading can be turned off entirely. SQLEditor 2.5 now splits off database operations and anything involving Java into a separate process. This was primarily to provide more protection with native drivers, if they crash. However it also means that there is no Java VM running in the main process at all, which should make SQLEditor open an editable document faster from cold start. The worker thread is started, but can then load java separately, you don’t need to wait for this to happen.There is also better stability should JDBC driver discovery hang or crash, because this is running in a third process. Overall there are more processes, but it doesn’t seem to make that much difference memory wise. Plus Chrome does something similar, so SQLEditor is in good company (or so I’m hoping). Alternatively the in-app updater should be offering the upgrade right now. Upgrading via the in-app updater also reduces the download size, because, in many cases, it only downloads the changes between versions, rather than the whole app. I’ve had this post sitting in my drafts collection for ages, but after reading yet another person make this claim about corporations, I’ve decided to post it. I believe that my sources are correct and accurate, note that the main source now links to the internet archive, rather than the original paper, because the congressional committee site has been rearranged. Please comment or email if you have any questions or concerns. This is something that pops up fairly frequently, the idea that corporations are required as their sole duty to maximise profits to shareholders. And in other places like the UK? NOTE: The above has been slightly edited for length. Hopefully without affecting original meaning and intention. This doesn’t in any sense excuse companies that behave badly. In fact it adds criticism to them; if they are NOT legally required to behave badly, why do they still continue to do so? Following from my previous post about SVG exporting in cocoa, here are some details on how this is done in SQLEditor. The example code is extracted from the live SQLEditor code base, but it’s been altered to simplify in a few places. Hopefully it doesn’t contain any bugs, but please point them out if you see them. The key point is that SVG is just a dialect of XML. This means that we can use NSXMLDocument and friends to generate the SVG, which makes life much easier than it would be otherwise. objectListByZOrder returns an array of objects, ordered by zOrder, from back to front. We also use a viewBox, which is set to the value of imageBounds, a variable which contains the bounding rectangle of the objects in the document. This is already set up by the time this code is called. Each object has a specific export<objectClass>ToSVG method, in this caseexportSQLCanvasAreaToSVG. It sets up a new group, draws the background and the title, then returns the xml element back, so it can be added to the main image. As you can see, the text drawing section makes a number of hard coded assumptions right now. Those were chosen to match the SQLEditor default drawing styles as closely as possible. It’s not a perfect match though, due to the variation between drawing in a cocoa NSView/NSWindow vs drawing in a SVG context (usually in a browser). Fonts are something of an issue and there are issues with rendering across platforms. Overall though, I’m quite pleased, the first phase of SVG export didn’t prove too troublesome to implement and added a useful feature to SQLEditor without either too much coding, or any extra dependencies. Statue of a mouse knitting dna (imgur)- apparently a memorial to laboratory mice. Regardless of opinions about lab use of animals, I think a statue remembering them is correct and proper. The database connection setup panel in SQLEditor has been something I’ve been hoping to improve for a while. The connections are now listed in a collapsable sidebar and can be both added and removed. You can also edit the connection in the main area. Changes are automatically saved. It’s not ready yet, but it may appear sometime soon. One of the new features in the latest SQLEditor 2.1 beta release (v2.1.0b2, about 5.7MB) is SVG export. This allows you to create a diagram in SQLEditor and then export it to SVG format. SVG format is a vector diagram format that can be rendered by many web browsers or edited in vector drawing programs like Inkscape. The neat thing is that if the image gets scaled it should scale fairly cleanly. This should work in Chrome, Safari and Firefox. There are currently some issues with Opera which doesn’t draw the text. I think this is an error in the SQLEditor export code somewhere because I have some early test versions that do work in Opera. I haven’t tested this with Internet Explorer, but SVG is apparently supported in v9. I’m still fine tuning the details on this, the examples on this page were tweaked to include a defined view port so that they clip properly and don’t include a lot of white space. This should get done during the export in the next release. I’m hoping to write another post about how SQLEditor is doing this, it proved to be fairly easy, except for the difficult bits. Often when I’m working on an app or something I end up running several different versions of it in a short period of time. There’s usually some bug that I’m trying to fix and I want to make sure that the bug occurs in the old version and doesn’t occur in the new version. Sometimes though I get confused which version I’m running. Is the app in the dock the old version, or the new version or something else? So today I had an idea: Why not put the version number on the dock tile? This assumes that you’ve got DEBUG defined somehow and that you have an infoDictionary with the relevant keys and values set. Regular version on the left, development version on the right. I’m not sure how useful this will actually be, but it seemed a handy trick for development. The consoles are still competitive platforms. Nothing in the phone world lasts that well. This is not a criticism of the iPhone, which is a brilliant device, instead a thought about the longevity of the consoles. The idea only dates from about 1976, it doesn’t seem to be in any law and it probably doesn’t lead to the best outcomes anyway. Multi-touch – finger tips wearing out? Years ago I saw a documentary about Russians living in the country side where the local people had to push, by hand, a railway wagon filled with bread. Apple: please provide more modifier keys on the keyboard for even more complicated shortcuts! Cancom seems to have closed their Edinburgh shop after being bought out by Trams. The amazing thing is how small the mechanical parts are, and how many there are in there. This camera probably costs no more than £200, yet there are minuscule parts and an amazing level of tiny details, all of which has to work reliably, without any maintenance, for a possible lifespan of several years. The details of the lens assembly are particularly clever with multiple layers and motors which move the different parts. The coils which are printed onto the circuit board and form part of the movement mechanism is clever feature. Kodak, perhaps the photography company, appears to have filed for bankruptcy. It seems to be something of a representative for the state of the non-digital photography market, which looks pretty much dead except for a few limited areas. In recent years they seem to have sold off much of the research and development and focused on the hyper-competitive desktop inkjet printer market instead. I remember having a kodak camera with kodak film, that got photos printed on kodak photo paper, but I guess people a bit younger than me might never have even seen a roll of film, nor for that matter a kodak camera. It’s sad to see this happen to such an iconic company and I hope that things don’t turn out badly for the employees. Just hours remain to buy the The Web Development Kit Bundle. HTMLValidator is one of the apps in the new Web Development Toolkit bundle, which is available now. The offer is running until December 28th, so you will have to be quick, or you might miss out! I ran into this when I was doing testing on 10.7 and although documentation clearly states that you must call the super method in validateMenuItem: , it wasn’t immediately obvious to me what was causing the problem.